The Upper Westside Journal: Share Ferris! Movies are universally enjoyed, but not universally remembered. Yet we just love quoting movies. Last week I held a brainstorming session at New Work City to explore how movie quoting could be made shareable. The goal is to use the web so that the effort made quoting movies can more enjoyable, especially for those who have not seen the movie or don't remember the quotes. There were two types of ideas, those that made it easy to share, and those that built on the enjoyment of movie references. Our favorite day-to-day video sites, youtube and hulu have not developed their search algorithms to be narrow enough to catch quotes effectively. Look on Hulu for SNL clips and you'll notice that you get lots of garbage when you type in a sentence you heard in a skit. Movies do not even have real live database, all we have is curated quotes on IMDB, and a cottage industry of movie fans who curate sites like killerclips.com and others that find the best clips amongst a small set of top movies. 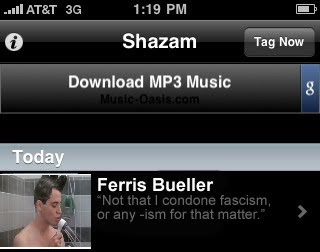 Shazam Integration so you can speak a quote into your phone and get back the clip to tweet. 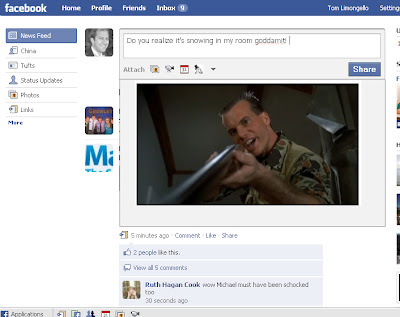 Create a Facebook app that can use predictive text to pull movie clips based on what you're looking to post or comment on your friends' walls. The Shazam, Facebook and Instant Messaging examples require an API where you can pull on the fly clips from the whole movies, not just a canned clip arbitrarily posted as a well known funny scene. One problem with a curated model where only the funniest clips are made available is that there's no incentive to make the whole movie available. The NYT arranged John Hughes movie quotes last week as a memorial, but there's not enough room and these cannot be shared in such a way that they can handle the real time desire for incorporating quotes into web communication. I'm not looking for Tom Cruise's clips in Risky Business, I want to be able to pull Bronson Pinchot Curtis Armstrong and Joe Pantoliano talking about 'wonder woman', the 'trig midterm', or 'I can't go $250 for the artsy fartsy thing', respectively. That has been the trap we fell into with Wikipedia and IMDB offering 'best of' information repositories. 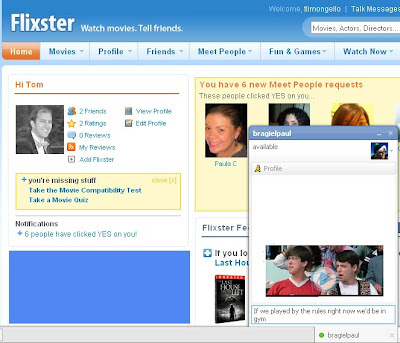 But the social web has provided a new mechanism for movies to enter the dialog. Facebook and Twitter has enabled accounts and fan pages that are truly connected to actors. We should be able to call out to those actors, and they should be able to respond to us in context. We need a company with a higher purpose. Someone needs to do the groundwork that enables an agnostic catalog of movies tagged in a way that users can generate clips on the fly for their own purpose. For those of us who have seen the canon of hilarious movies more than 10x a piece (I round down to save face) it is not the obvious, canned clips that we want to share. Automate a way for celebrities I fan or follow to chat back in my conversations with a verified, authoritative, "pardon me guys" comment and associated clip. Say, I'm a fan of Bill Murray on Facebook and I say to a fellow looper 'There won't be any money, but on your deathbed, you'll receive total consciousness' and tag my comment #clip I'll summon the Bill Murray fan page to reply within the thread: 'Which is nice' and the associated video clip from Caddy Shack. Writers could use movie quotes to enhance their writing by enabling a much shorter description of how they see their story about some event happening now to be reminiscent of a movie. If any of the semantic blog services like Zemanta, (pictured below) OpenCalais, Disqus, Apture, or firefox plugins Glue or Juice were to incorporate a useful movie quote search API, they could do a better job than just putting stock photos or links to IMDB, which is generally what they do now. There are of course two business models here - the studios can get involved for DVD releases where they create buzz around the time when DVD's are about to hit retail, netflix and amazon. And there's an unlimited time period when adverters could sponsor movie quote clips just like they currently sponsor music mixtapes in apps like Pandora. If a contextual advertising engine like Adbrite, AdRoll, Kontera or Vibrant media integrated a movie quote search API, sponsoring clips could be done with only a bit more effort than buying keywords. Let twitter users generate IB (inspired by) mentions, maybe use the new RT API to make this happen. If you liked Obama's recent opinion piece in the NYT on healthcare you could comment 'I think you're right', but wouldn't it be more powerful to use a clip from the 35 year old Mel Brooks classic Blazing Saddles? There's a scene when all of the people named Johnson from Rock Ridge rally to fight for their town, so why not tweet " Obama is right! http://bit.ly/13BFfc IB Blazing Saddles http://www.splicd.com/xQY5qoolark/414/443 "
That example above may sound complicated, but our appetite for using movies as a reference to our collective psyche get much more convoluted, take this beautiful mashup of Ferris Bueller and Fight Club that @robertgorell sent me as part of the brainstorm last week from Kottke.org. Movies are not yet useful on the web, and the dynamic movie quote search API is what we need to merge the Silver and LED screens.